The EA Sports Cup final takes place this Sunday at The Brandywell and home side Derry City appear to hold every advantage going into the clash with Cobh Ramblers. 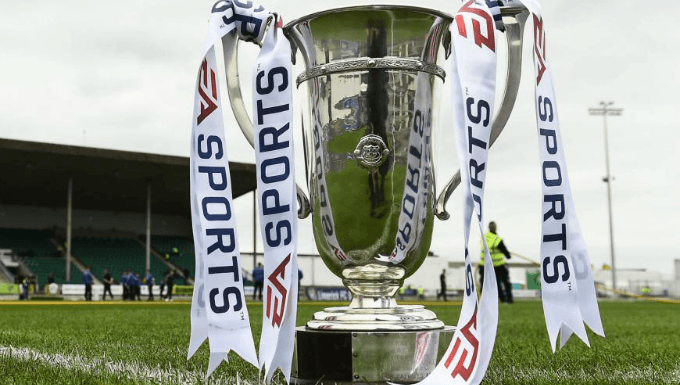 For those unfamiliar with the competition, the EA Sports Cup is the secondary cup competition in Irish football, similar to the League Cup in English football. When you are talking about the League of Ireland Cup, in whichever of its various guises over the years, Derry City are a prominent part of the discussion, and once again find themselves odds-on favourites to win at 4/11 with 888 Sport. They haven’t reached this stage of the competition since 2011, when a second half Eamon Zayed penalty gave them a 1-0 win over Cork City, but their pedigree in the tournament is unquestionable. No team have played in more finals (12) or won more (10). Cobh Ramblers, perhaps most famous for being Roy Keane’s first club, will be venturing into new ground this weekend. The Munster Senior Cup is the biggest stage the County Cork side have known, setting up a real David versus Goliath clash at Brandywell Stadium. History is not the only advantage that Derry enjoy. In addition to them already being in a higher league to their opposition, they have home advantage. Unlike most other Cup finals, the EA Sports Cup Final is not hosted at a neutral venue. Once the finalists are decided, home advantage is decided by a coin toss, which Derry won. It will be second League of Ireland Cup match that The Brandywell has hosted this season, with the other providing the backdrop for Derry’s 7-3 thrashing of Shelbourne in the quarter finals. One piece of good news for Cobh, though, is that Ronan Curtis, who scored a hat-trick in that win, has since left for Portsmouth. Another is that just how much ‘advantage’ Derry receive from playing at home is questionable. Since that Shelbourne demolition, Derry have played 13 matches in all competitions on home turf and lost eight of them. Since losing Curtis, seven of their 10 home matches have ended in defeat, and Cobh are 7/1 with Paddy Power to help worsen that record. Let’s be clear: Cobh are not in good form themselves. They are languishing down near the bottom of the Irish First Division – the second tier of Irish football – and their form heading into the final is remarkably similar to Derry’s. What Cobh probably do have on their side, though, is a degree of fearlessness. Cobh are, and always have been throughout their history, a very young team. There will be no shortage of teenagers in their ranks and, while that will be Derry a significant advantage in terms of experience, it does add a real unpredictability to proceedings. They have some recent cause for enthusiasm too, after traveling to Oriel Park just last month to face the Premier Division leaders Dundalk in the FAI Cup. They came up short, losing 3-0, but they were involved right up until the closing stages, so they know they can rise to an occasion. Unlike Derry, who lost at home to Bohemians last week, Cobh come into this one on the back of a win in the league, and an away win at that. Despite Derry’s struggles, you’d still have to have them as favourites to add to their imperious League of Ireland Cup history, and the bookies certainly agree. They have home advantage, they are playing lower-league opposition, they have the experience advantage, both in terms of years and performing on a bigger stage. Cobh have nothing to lose though, and that makes them dangerous, so don’t discount them completely. What it won’t be is a formality for Derry. They will be made to work hard for the right to press home their advantages and, given their struggling confidence levels right now, they may have to be patient. That would make the 27/10 on a draw HT/Derry FT bet worth considering at 10Bet, and Karamba's 5/4 on the second half having the most goals, as Cobh will begin to tire. They aren't expected to win, nor are they expected to score goals. Cobh, for all their youthful energy and enthusiasm, are lacking in quality where it counts in front of goal. Their First Division season has been a tale of defending resolutely and failing to capitalise, with their dismal haul of just 24 league goals in 26 games testament to that.